The Lonely Planet sticker in our front window. Tucked away on the 91st page of Lonely Planet: Colorado is a listing for what sounds like a pretty sweet Denver business. It has “retained the rare magic of a real bookshop” That magic presumably enhanced by threadbare rugs, creaky floors and cardboard cutouts of dead celebrities. 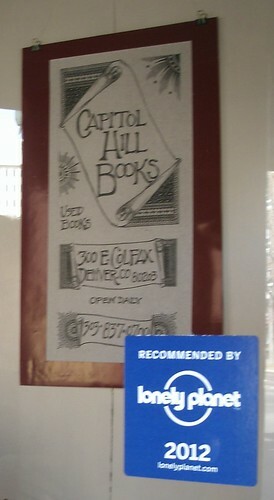 The store is of course Capitol Hill Books. And we are proud to be included among many of Denver’s top independent businesses in the latest edition of Lonely Planet: Colorado. With our location across from the Colorado State Capitol, our bookstore has long attracted tourists from across the country and around the globe. We’re very grateful to Lonely Planet and our customers for continuing to support our independent business. Whether you are from Denver or Dublin or Dubai, we have a book here at our store waiting for one of our staff to recommend to you. This entry was posted in Uncategorized and tagged Capitol Hill Books, Denver bookstores, Independent Businesses in Denver, Lonely Planet, Travel Denver, used books in Denver.. Bookmark the permalink.